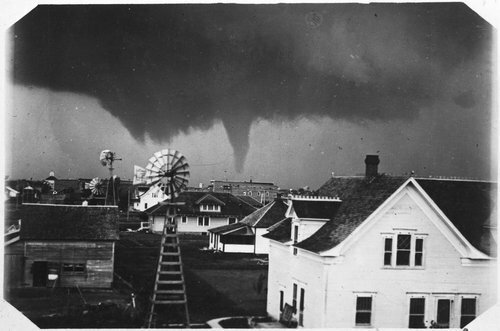 This black and white photograph shows a tornado approaching a town in Kiowa County, Kansas. The photograph appears in a 1919 article in the Monthly Weather Review (July 1919, 47: to face page 448) identified as Mullinville, Kansas. Mullinville is ten miles west of Greensburg on state highway 54.